The Microsoft Surface 2 has been announced, so check out all the latest details here. TechRadar is at the event so be sure to keep checking back for our Hands on: Microsoft Surface 2 review. We're fans of Surface on TechRadar, even if we think that Surface Pro is too expensive and Surface RT is too limited. But a big problem with Surface Pro appears to be battery life, with around four hours reported for most. That's about half the battery life of Surface RT and the iPad, but while you might not be too surprised considering the Intel Core i5 that the Surface Pro runs, we'd point you in the direction of the six or more hours that many Ultrabooks can reach. In a two hour AMA (Ask Me Anything) session on Reddit, head of Surface Panos Panay talked about the Surface Pro in detail and had to defend the battery details against Redditors who suggested Panay - and fellow engineers who also appeared to be participating in the chat - were giving guarded answers drawn from marketing speak. They had a point. Exhibit A is a key passage about the battery life and size, and the compromise that has been made. "If you compare [Surface] to say a MacBook Air, you will quickly see that pound for pound in battery size vs battery life, you will find optimizations that puts Surface best in its class. "That said we picked a smaller battery to be sure we were able to give you the same performance and to keep it thin. This kept the weight under 2lbs. While these tradeoffs are challenges as much as they are opportunities, we think given the performance and experience you will be getting, it is an exciting product." Put simply, the 42Wh Surface Pro battery had to be small and, while it's good for the size, there are compromises as a result. Commenter Wiseasss wasn't appeased. "In every paragraph you insist that the computer has 'no compromises', and then turn around and talk about the compromises you made. What exactly is the difference, in your mind, between 'compromises' (which you say this product does not have) and 'tradeoffs' (which you say it does)?" His thoughts echoed many comments that suggested the Surface Pro's battery life made it poor value up against competitor tablets and Ultrabooks. But Redditor marm0lade could see that physical size was the restriction, and that's how it had to be. "Do you not think they are squeezing every ounce of battery life that they can get? It's a power hungry CPU with a tiny battery. But you need that CPU to be able to run desktop apps (do actual work). I have the Samsung Ativ tablet, which is running the same CPU as the Surface Pro, and I get 7 hours battery life. It, again, has a bigger screen/body which allows for a bigger battery." You'd hope Microsoft could pack a bigger battery inside the Surface Pro, but judging by its responses here, there is precious little that will happen in the short term - it simply opted for power over longevity. After all, if it had wanted to offer a more frugal Intel solution, it would have opted for the Atom chip being used by others such as the Asus VivoTab. Some respite was provided by the Surface engineers, who were surprisingly positive when questioned about whether an external battery could be on the way for Surface Pro. "That would require extending the design of the accessory spine to include some way to transfer higher current between the peripheral and the main battery. Which we did..."
Commenters were immediately enthusiastic. Here's Skaarg: "That response 100% sold me on the Surface. I'd been debating between the Surface Pro and other devices such as the Vaio Duo 11, Yoga 11S, etc. but knowing that an extended battery or keyboard with a battery is in the works makes me much more comfortable buying this device." Panay also provided more detail about new connectors found on the Surface Pro's bottom dock, writing, "Wow - I'm pumped you caught that! We haven't announced what they are for but they aren't an accident!" he continued. "At launch we talked about the 'accessory spine' and hinted at future peripherals that can click in and do more. Those connectors look like can [sic] carry more current than the pogo pins, don't they?" So as well as a powered keyboard dock (the like of which is appearing on many other Windows 8 devices, could we also see other peripherals appear such as a battery pack or full dock? Only time will tell. Storage space - or lack of - was also a bone of contention during the AMA. According to Microsoft recently, the base model Surface Pro with 64GB of storage only comes with 23GB of free storage. 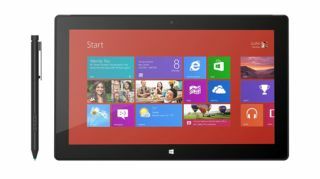 That means Windows 8 Pro and whatever other default programs and apps come loaded on the tablet will leave just 36 per cent of the drive open for users. The 128GB model fares better, with 85GB (64.8 per cent) of the storage space left open for people to use. The Surface RT also went through some similar memory troubles. The 32GB Surface RT included just 16GB of storage when it arrived, and the 64GB version allowed users to work with 46GB of space. Over the course of many tens of comments, Redditers were highly critical of the amount of space used up, comparing the device to others where free space was not as cited, but was still a smaller proportion of the storage space (the iPad or an Android tablet, for example). Sag969 suggested they should have "cancelled the 64 GB model, sold the 128 GB model at $899 with no keyboard and the 128 GB model at $999 with a touch OR type cover" to alleviate the storage issues but still hit a reasonable price point. An interesting titbit was revealed in the talk – that Office 2013 is actually pre-installed on Surface Pro - you just have to activate it. Asked if this was the case, the Surface team replied "Yes, that's exactly what it means :)." On the 128GB version, the drive is formatted to 119 binary GB of which 89 GB is available. 10.4GB of that is taken up by Windows, while there's 2.3GB of Office 2013. 7.8 of those can be freed up by using the built-in tool to move the recovery data to a USB drive. The Surface team unsurprisingly suggested that the answer to a lack of storage lay with extending space via the memory card slot, plugging in an external drive or using SkyDrive adding, "Windows does provide tools that allow you to free space by easily removing applications you are not using as well as move the recovery image to a USB thumbdrive." "We decided to ship a Pro 64GB sku as it provides full Windows 8 and enough storage for a number of large application installs. It also provides you flexibility to extend storage should you need. If you plan to carry more personal items with you locally, our 128GB may be the better option for you." "Available disk space is a design choice and a tough one to make as an engineering team," said the engineer, saying it was the result of "a clear set of tradeoffs to provide the customer more space while providing them the tools out of the box". "There has [sic] also been questions about why including the recovery image by default. Ideally, you will never need your recovery image, however this is a choice we would prefer the customer to make vs. having the customer need the recovery image not realizing they needed to create one themselves." During the chat the Surface team also cleared up how it came to ship the Surface Pro after RT. And the answer is surprisingly simple: "We started the Pro 3 months after we started Surface RT :-) That is exactly when we staffed the team to go and bring this product to life." The final point of interest from the AMA concerned the 1920 × 1080 ClearType display that comes with the Surface Pro. Primarily because Windows has been, well, a bit poor with 72dpi+ displays in the past. As we've used an HD Asus Zenbook Prime with Windows 8 before, we can confirm that Windows 8 can play ball in this area, but the Surface Pro is reportedly not too good with this. But Windows 8 also can't scale differently on two displays, which is a problem for some. About this, the Surface team said: "The Windows team is aggressively working on this feature to fix this for all high resolution Windows devices. We don't have a date yet to share, so sorry. But in the meantime here are some things I do to maximize my external monitor experience." Ed from the Surface hardware development team also commented that DisplayPort on Surface Pro can drive an external monitor with resolutions up to 2560 x 1600p: "We wanted to give the most flexibility with monitors available today, and generally speaking most HDMI monitors are limited to 1080p." Microsoft has also published a separate engineering briefing on the Surface's display. Naturally Microsoft will be working to fix these limitations, and it will be extremely interesting to see how Surface Pro performs in the market. After all, it's an extremely capable device by any metric, but while it isn't as powerful as many laptops, it is more expensive than them. It's also isn't as energy frugal and is more expensive than many tablets. Can Microsoft make it work? Or has the Surface RT just confused things? Roll on Surface 2.